Recently, after a 12-day trip in Europe I arrived home in Portland, Maine, to unexpectedly find a substantial amount of snow on the ground. A voice inside me screamed, “oh, no, I’m not ready. It’s not even Thanksgiving yet.” This was not only a knee-jerk emotional response but a practical one, too. You see, my garden hoses were still out, now inaccessible, buried beneath the snow. This unexpected climatological transition was going to demand more work than usual. Many transitions, be they emotional or physical, are expected and give us time to prepare, adjust and manage, but some don’t. And even when expected, the adjustment may differ dependent on various conditions or circumstances. For example, research shows that our bodies adjust in time to colder temperatures. However, the same cold temperature experienced at the beginning of winter or at the end feels different. By the end of winter, we have adjusted and so we actually don’t feel as cold. When transitions are expected, like going off to college or getting married, we are able to prepare and elicit the necessary support. However, the unexpected ones obviously present greater challenges. It is as if we are left flat footed and thus ill prepared. Some transitions require management and swift action–your plane gets cancelled and you have to find accommodations for the night. Some require not just swift action but a more complex readjustment and response as when your work place unexpectedly closes and you must find alternative employment. And then there are those that have a more profound emotional impact such as when a loved one suddenly and unexpectedly dies. Managing this last transition may take a long time and requires faith that the emotional wound will heal and life can get back to “normal.” Action, in this case, requires acceptance and an ability to elicit and receive support. Many individuals who come to our programs are in the midst of transitions. Some are changing careers, some are undergoing lifestyle or relationship changes, some are seeking more meaning in their lives and in their level of self-awareness. Some just want things (whatever that might be) to be more fulfilling. Having an optimistic stance supports us to look at what is good or valuable in any situation or relationship. It allows us to cope with the expected and unexpected changes that are the essence of our lives. And, even when transitions elicit disappointment and grief, optimism supports us to persevere and move forward in a positive direction. All our lives are full of transitions–small, insignificant ones and large, life-changing ones. Although we can never guarantee that we will not at times be caught flat footed, we can develop skills and emotional resiliency that provide the ability to face those challenges and learn from them. Now to find those garden hoses! I have been thinking a lot lately, about how my participation in the Cape Cod Training Program might contribute to making the world a better place. When my mother came to visit my college dormitory, she commented to me when we stepped off the elevator, “You seem friendly with that girl. I was friendly with my non-Jewish school friends AT school,” she said, “but we never invited them into our house.” The only non-Jews who entered our house when I was growing up were the plumber or the electrician. I was taught that difference was dangerous. Difference had taken the lives of my parents’ cousins, my great grandparents, and many other relatives and friends. Difference robbed my two beloved great aunts of their fertility, as they had been used as human experiments by Nazi doctors in the concentration camps. So many of the troubles of the world stem from our fear of difference, and from our lack of close contact with people who are different from ourselves. When we gather outside on the last day of CCTP, planting bulbs that will blossom into daffodils in the spring, we are marking our connection as a group, the learning community we create in spite of, and as a result of, our differences. Let’s take this experience back to our lives, and remember to stay curious and to move toward difference rather than moving away from it. Some of you have asked what your next step should be after taking CCTP. For those of you who have not taken the Third Week, talk to someone who has and sign up. The Third Week is an opportunity to build on and expand what you learned in the first two weeks of the program. The next Third Week is scheduled in England this November. Sign up soon as the class is almost full. If you want to take it in the US, let us know and we will start to put the next class together. We are also offering three days of Supervision in Wellfleet in March 2019. That is the best way to continue to develop yourself and your skills–by being a member of a group, presenting practice dilemmas, asking questions and watching the faculty work. We always enjoy hearing from you and we would love to see you again. Please stay in touch. As winter gives way to spring, I find I’m learning to slow down and breathe again. It seems like such a simple act but hard to maintain, and one I easily forget. So I’ve taken to getting up most mornings and watching the sunrise. I’m lucky to have a second-story room that faces east. Three large windows look onto four magnificent white pines, nearly twice as tall as my home. I’m watching this morning as I write to you. There’s something about the sunrise that makes the relearning easy, especially with the many sunny days we’ve had here lately. Maybe it’s because the sun compels me to surrender to its beauty, to give up thinking and doing and to simply be. No matter how many sunrises I watch, each one is different. Even now I find myself putting down my writing tablet. I don’t want to miss any part of this experience. I want to see each shift in color, each increase in intensity, each new pattern that emerges. This isn’t unlike how we are with our clients. Slowing down and attending to “what is” gives us a window onto the nuances of our clients’ experiences, the shifts in expression, color, tone, or breath. Slowing down helps us to see and be with them in the many difficulties they must bear. And it helps us to bear ours as well. I remember as a child lying on the couch with my back to the world, tracing my finger over vines of ivy in the fabric’s raised surface. I can see now how, even then, I was learning to slow down and bear the weight of a chaotic world. I was learning to regulate myself. The winter has been a difficult one for many of us, challenging our capacity to simply be. The world seems increasingly more chaotic and unpredictable, existential threats increasingly real. Maybe you, too, got caught up in chasing the news and forgetting to breathe. I’m reminded of a quote from Moshe Feldenkrais, “You can’t do what you want until you know what you’re doing.” I would add to that, and we can’t know what we’re doing unless we slow down long enough to notice. To those of you who do not know me, let me briefly introduce myself. I’ve been involved with GISC since the Center opened its doors in 2002, and for over a decade before that I participated in a supervision group led by GISC senior faculty. I have a coaching and psychotherapy practice in Bloomington, Indiana, a daughter and a grandson in Myanmar, and a cottage on Lake Superior where, during the summer, I watch the sun rise over the lake every day. I’ve watched the Cape Cod Model develop over the decades, and I’m thrilled to be a part of a program I wholeheartedly believe has the power to change lives. I look forward to meeting and greeting you in person as time goes by. Lately, as I sit with clients, I have found myself exploring the experience of not knowing. It’s notable because I have spent so much of my professional life wanting to learn and grow … which necessarily involves knowing things. I assume we all do that. But as I said, I have been exploring “not knowing.” I find I am enjoying “not knowing.” Perhaps it’s really the experience of not having to know. I think this is making me a better practitioner … therapist, coach, consultant. It provides me a lot of freedom. However, the road to “not knowing” has not been comfortable for me. It’s too close to the experience of feeling “stupid.” Perhaps turning 66 has helped me get over that! I’ve noted, when people see it for the first time, how hard it is for some to see the young lady if they first see the old lady, and vice versa. For those who don’t see both ladies very quickly, it can be a frustrating and confusing experience. And the reason it can be so difficult is that seeing the unseen in the picture isn’t reliant on an additive process. In order to see the other configuration, we have to de-construct the one we originally see. We have to genuinely “let it go” in order to allow the new image to emerge. We have to “un-know” and “un-see” something in order to see something new. And, as I have said, un-knowing or not knowing isn’t so easy. But the implications for our professional practice are just as relevant. It is one thing to understand that in any one moment I may not know the client’s experience or may not know how to be helpful. It’s another thing altogether to actually allow myself to embody the uncomfortable sensations of “not knowing.” However, it offers the opportunity for genuine curiosity. Paradoxically, it can allow us to join in a rich, authentic and empathic manner. Interview with Marianne Reiff, PhD done by April Gregory. Marianne recently completed the Executive Personality Dynamics for Coaches. Listen in as she talks about her experience with the program. When a course of therapy with psychologist Dr. Sonia Nevis ended and a client struggled with goodbye, she would ask her patient to pick up one of the many glass figurines in her office — a little glass horse, perhaps, or a cat. Then she would tell her client to break it. “They are often surprised and may physically pull back. They will sometimes say, ‘Don’t you care about it?’ I might answer, ‘Yes, very much.’ They will say, ‘So why do you want me to break it?’ ” Dr. Nevis said in an upcoming book. Over the past few decades, Dr. Nevis taught and mentored thousands of psychology professionals, managers, and business leaders in the concepts of Gestalt psychotherapy at the Gestalt International Study Center in Wellfleet, which she founded in the late 1970s with her husband, Edwin. Unlike the Freudian focus on mining the past, Gestalt psychology focuses on living in the present and teaches that the whole of relationships is greater than the sum of its parts — with the parts deriving character from the whole. Dr. Nevis was masterful at living in the present and helped develop the center’s core training programs, colleagues said. 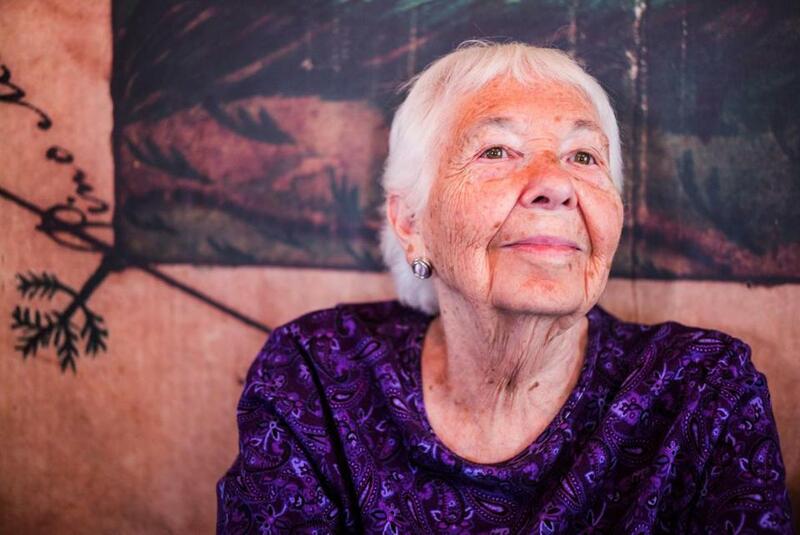 She was 90 when she died Sept. 10 in a Brighton nursing home, where she had lived for several years and led sessions on finding happiness. No one could predict what Dr. Nevis might say, said Stuart Simon, a Gestalt practitioner who teaches at the center and formerly was her student. “Usually it was creative, brilliant, and rarely without some commitment to the heart,” he said. He said he used to joke with her that she was “a mutant” — she had a difficult childhood, but emerged optimistic, strong, and full of kindness. She was 5 when her mother died while giving birth. Her father was mostly absent in her life, and she was shuttled among relatives who paid little attention to her. She had no one to say, “I love you,” and no one to say, “I hate you,” one colleague observed. “When you were in her presence, you just felt better,” said psychologist Joseph Melnick, a longtime friend of Dr. Nevis who had been her student and then taught with her for many years. A collection of their conversations are included in their book, “The Evolution of the Cape Cod Model, Gestalt Conversations and Practice,” which will be published next year. Dr. Nevis, who stood a little over 5 feet tall, could scribble a few sentences on an envelope in preparation for a lecture and command an audience. “You couldn’t say anything to shake her,” Melnick said. When a male therapist she was supervising blurted out that he would like to sleep with her, Dr. Nevis’s comeback became famous among her friends. Born in Brooklyn, N.Y., Dr. Nevis was the daughter of Kelman March and the former Ruth Kwitko. She graduated from Brooklyn College and met Edwin Nevis in New York while socializing with friends at the movies, according to her family. They married in 1948 and moved to Cleveland, where she graduated with a doctorate in psychology from what was then Western Reserve University. In 1956, they helped found the Gestalt Institute of Cleveland with a mission of training couples and family therapists. Edwin, who also taught at MIT’s Sloan School of Management, died in 2011. While Dr. Nevis was raising her two daughters in the 1950s, she became a student of Gestalt founder Fritz Perls. Friends invited her to attend a Gestalt workshop in Cleveland with Perls, and Dr. Nevis experienced a transformative moment. In addition to her daughter Amy, Dr. Nevis leaves another daughter, Melanie, of Brooklyn; a brother, Ronald March, of Wyckoff, N.J.; two grandsons; and a great-grandson. About 100 friends and colleagues gathered at the center last Sunday to celebrate her life. Dr. Nevis enjoyed playing bridge and poker. She also loved listening to the great female jazz artists of bygone eras and going to a Wellfleet theater for live broadcasts of the Metropolitan Opera. Her book includes a paragraph that contains a few guiding principles for navigating intimacy while remaining authentic and human. J.M. Lawrence can be reached at jmlawrence@me.com. I met Quoc Pham at lunch one day in 2014. My brother knew Quoc’s son Hung and had asked me to consider writing Quoc’s story about imprisonment in post-war Vietnam and his eventual harrowing escape by boat into the South China Sea. The idea of writing a book, or even a short story about someone’s life, was not my focus that day. After retiring from corporate life in 2013, I had been building a coaching practice and even temporarily shelved writing a story about my grandfather’s war exploits. But my twin brother, who served as the captain of Hung’s ship at Massachusetts Maritime Academy, gently prodded me to “just meet” Quoc Pham, who was visiting from California. As I asked questions and listened to Quoc that day, I carefully watched his face. He had been through more than anyone I know; yet there was a serenity about him that was calming. He had experienced brutal conditions in the Reeducation Camps of Vietnam, been punished for being in the South Vietnamese military and saw his family lose everything. He had been beaten, nearly starved, and seen people die, yet here he sat, placid and kind. And yet… I shifted my eyes from his whole face and looked deeply into his eyes and saw something that I had not seen since I left the Army. I saw a glimmer of regret and grieving. It was merely a glimpse, but it was enough. That one glance reminded me of what I had seen in the U.S. Vietnam Veterans with whom I served in the Army, who had been through the horrors of war so far away, and then watched as the “enemy” defeated their own country. We agreed to meet every two weeks via Face Time, as Quoc lived on the opposite coast. We began right away, adhering rigorously to a schedule of one hour every two weeks, which would continue for three years. Our routine evolved into an hour of interviews and coaching, followed by about six hours of drafting by me, followed by comments and editing from Quoc. Like any solid coaching engagement, one session built on another; trust grew between us and figures emerged routinely. At one point, I saw Quoc’s son, who had seen some early chapter drafts. “My father is telling you things my siblings and I have never heard – how is it that you and he communicate so well?” I just smiled and thought about coaching and knew that something was in synch for Quoc and me as we co-created in our sessions in order to tell the story of his life. Often, I gave Quoc time – sometimes long minutes – to collect himself. Part of coaching is giving someone time and space to think. Such silence is uncomfortable for humans – we just don’t cope well with long gaps in conversation. But those gaps can allow the person with whom you are working have thoughts emerge that might never have surfaced. Quoc’s and my journey together in our calls and my follow-up draft-sharing were the vehicles we used to create The World Looked Away – Vietnam After the War: Quoc Pham’s Story. In it, you will see and feel his deepest thoughts about not just his camp experiences, but his feelings about the woman he loved and the family that nurtured him. Being a coach has expanded my range of possibilities and helped me understand those of others. I use the tools of Gestalt Coaching every day in every conversation, be it coaching or dialogue with friends and family. I know I could not have joined another on his journey and completed a 400-page book without the benefit of my coach training at GISC. Here at GISC, the sun is out. Fourteen professionals from as far as California, Sweden, Wisconsin and Denmark or as close as Wellfleet gather for their 7th day of training to learn the Cape Cod Model – our Center’s process for helping people and teams change. Five years ago, I was in their seat as a participant and fortunate to have our founder, Sonia Nevis in the room. An avid note-taker, keen on capturing the words from each faculty member, I’ve saved my notebooks and I’ve decided to share some of the nuggets from our Cape Cod Training Program teaching. Let’s start with the check-in – the first 15-20 minutes of each day when participants sit together with faculty in a large group to discuss any questions or thoughts that are present from the previous day’s work. Even in these seemingly mundane moments, we were being taught that “Gestalt is a way of looking at the world and thinking about your life.” Check-in is important “to get something out of your head” so we can start where we are today. The notes that follow are what I need to do this morning to start my day with a full sense of connection to the current participants, to the teaching and learning that inspired greater range and growth in my own life, and to the creative urge that the sun – after many days of rain – has inspired within. What’s the optimal blend of sunshine and support to foster new growth in your life today? If “no one person is making an experience happen” then join me in a virtual conversation and leave a comment below. It used to be that leaders and managers could rely on the old ‘command and control’ methods of getting things done. Back in the day, and standing atop a clear hierarchy, the boss was Lord (and less frequently Lady) of all he or she observed. These were simple, predictable and in some ways, relatively comfortable times. It used to be that the boss could shine, taking all the glory for success (deflecting failure where possible) and where people had confidence in a job-for-life. In today’s world of work, much has changed and those days are a distant memory. The command and control approach to leading and managing is now as outdated as the weekly wage packet. So what’s so different now? Workforce enlightenment – today, the average worker is far more educated, both formally and informally. Workers know their rights and how to exercise them. More of them also know how to use their talents and exercise power and influence. The information age – with the advent of the Internet, information is everywhere. This shifts power from the boss across and throughout the whole organisation and beyond, empowering many. We are globally connected – by way of social media; stories, events and campaigns can inspire and incite people (workers, customers, service users) meaning organisations no longer exist in their own discrete and predictable bubble. Higher degrees of complexity – in a time of increased specialism, it’s no longer possible for the boss to be expert in everything. Instead, today’s leader or manager must get comfortable at having people around them who are more expert in some other particular field/discipline. The leader or manager who can facilitate individuals and teams through the challenges of these four contemporary realities has a better chance of succeeding. Instead of commanding and controlling, it’s time to facilitate the workforce. Facilitation is an often-misunderstood term. In the context of leading or managing, it’s about employing processes and ways of being that makes it easier for leaders to get more done through others. Facilitation is about running effective meetings, keeping people focused and arriving at decisions that lead to appropriate and timely actions. Facilitation is about setting behavioural expectations and holding people to account when expectations fail to be honoured. Facilitation is about making it easier for people to bring the best of themselves to the task in hand. It’s about welcoming resistance and conflict with genuine curiosity instead of seeing them as a nuisance to be overcome. It’s about having proven skills, knowledge and techniques that allow leaders and managers to confidently negotiate the challenges that inevitably occur when bringing teams together. Participation – with so much expertise and insight available in an organisation, its madness not to access it. Maximising participation is essential – this means having the right people involved in the right meetings and making sure these meetings are conducted so that everyone, regardless of status, has a voice. Collective thinking – reliance on just one person to steer an organisation means only one mind on the job. Unfortunately, all of us are blinkered in some way or another. Facilitating collective forms of thinking may seem complex, time-consuming and risky but using facilitation skills effectively can ensure any number of participants can effectively contribute their collective brainpower to the issue being addressed so that a deeper, more informed conclusion could be reached. Ownership – when you create participation and facilitate collective thinking, you engender ownership for both problems and solutions – this is the magic of facilitation! People who are involved in decision-making processes early on can help shape thinking and prevent unnecessary resistance at the latter stage of implementation. Processes that work – The success of facilitation as an approach in organisations is that it provides leaders and managers with proven processes that work. Facilitating makes it easier to reach decisions that stick, explore ideas, share information, action plan, problem solve and foster learning. If you know command and control has had its day and seek to promote participation, collective thinking and ownership for your organisations vision and mission, get yourself skilled in facilitation – after all it’s your job to make it easier for the people you lead to be as amazing as they can be! Paul Cummings, MA, CPF, PCC, works with dedication and fun to facilitate organizations and people to think and act with greater confidence. He is a GISC Certified Coach and will be teaching Facilitation Skills at GISC in May 2016. We’d love to hear about your experiences with facilitation as a leadership skill. Please respond with your comments below.